Okay, enough about Chicago. I live in Toronto, after all. Actually, I've lived in Toronto for more than eight years, but I've never taken much interest in the Toronto International Film Festival which happens every September. This year, however, I was encouraged to participate and I saw three films. That's a lot for someone like me who isn't too into movies! Here's what I saw. All Around Us (ぐるりのこと), from Japan, was sweet, sad and subtle. The actors were so natural! A bonus is that my favourite Japanese artist Akeboshi did the soundtrack. 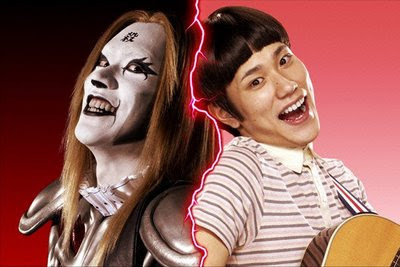 Detroit Metal City (デトロイト・メタル・シティ), also Japanese, is one of the funniest movies I'd seen in ages. It's the story of a twee young musician who lives a double life. Here's the trailer - even without subtitles you should get a concept of the hilarity. And, yes, that is the real Gene Simmons. 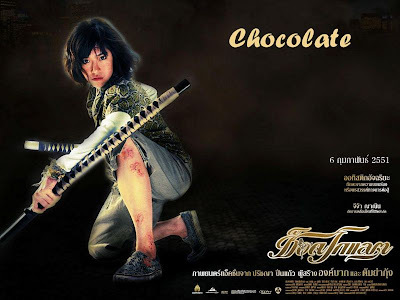 Chocolate is a film by the director of the Thai hit Ong-Bak. This time, the star fighter is an unusual girl. I have to be honest: the film was pretty cheesy in that typical martial arts movie kind of way. You know - fake punch sound effects, two kicks and that guy's down, the vicious gang attacks the hero one at a time... Despite all this, I was entertained because the fights were mostly awesome. PS Anyone want to go see Sukiyaki Western Django with me? Besides my interest in the Battle of Dannoura, my crush Katori Shingo gets some screen time! I liked Sukiyaki Western Django! Didn't know it's here though.